Traditional Sermons require removing yourself from the presentation. Great preaching is truth through your personality. However, traditional sermons assume that who you are does not affect the sermonic construction. Paradoxically, after totally ignoring yourself thorughout the process, you are told to place yourself back in the process at presentation. 2. Traditional Sermons don't worry about application until late in the process. We emphasize what the text said in the traditional approach. We spend much time trying to pull out what the text said. And then after determining what the text said, we attempt to apply the text today. But what if we don't see the application? We either force it to apply or we simply forget about application and assume that intellectual stimulation is enough. 3. Traditional Sermons only appeal to the intellect. Human beings are made up of both an intellectual and emotivel dimensions. If that is the case, then why do we only preach to the intellect? 4. Traditional Sermons do not necessarily have behavioral change as the objective. Some sermons seem to only pass on knoweldge. Their only purpose is to inform. Other sermons seem to encourage enlightenment. However, truly great sermons do more than enlighten or inform, they actually push for change in the hearer. 5. Traditional Sermons include a continual battle to keep the people listening. OK, you have worked hard to come up with this sermon, but now you have to get it heard. So what do you do? You come up with gimicks to try to help people listen. Some literally yell their voice away or whoop a conclusion irrelevant to their sermon to get the people back on board. Is this what good preaching consists of? 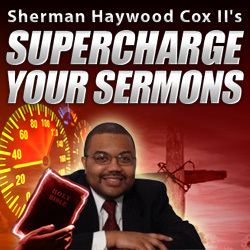 Supercharged Sermons make reference to the preacher in every phase of the preaching process! Who you are will affect your exegesis, sermon construction, planning, and presentation. The truth will come through your personality in a much more stronger way when you allow it to affect the whole process. 2. Supercharged Sermons allows application to guide the whole sermon construction process! Instead of waiting until the very end to apply the sermon to the people, the Supercharged Sermon allows the needs of the people to guide the whole process. So application is not a tacked on thing at the end, it is something that is at the core of the whole process. 3. Supercharged Sermons appeal to both Intellect and Emotive Dimensions of Humanity! People will remember the sermons becuase they will experience it in both the intellect and the emotive. 4. Supercharged Sermons are for behavioral change! There is an objective and that objective is changed people. Great preaching will be seen in the life of your people. 5. Supercharged Sermons have Congregational Understanding Built In! Here's the beauty of the "Supercharged Sermon" model: the people listen! Why? Because you have taken the concerns and hopes and pains from the people with you in the planning, exegesis, construction, and presentation. 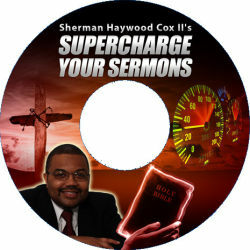 Who wants to Supercharge Your Sermons?! Introducing "Supercharge Your Sermons: Preachers in Training Program": A Step-By-Step, 26-Week Training Program For Planning, Constructing, and Preaching Effective Sermons! Every week for onehalf year (26 weeks) you'll gain access to another lesson. Each lesson will consist of a donwloadable audio and a textual lesson. Included in the lesson is an assignment for you to complete so you'll make progress every single week. Experiential Exegesis of the Text! Instead of publishing this in a ebook or physical book, I'm making it available to you week after week in action-sized portions so you'll actually get results. You don't need another ebook to clutter up your computer or physical book to clutter up your bookshelf. What you need is a weekly "here's what you do next" action step to complete. What you need is for someone to show you how to quickly get started and then keep teaching you week after week so you don't get stalled along the way. And that's exactly what I'm going to do when you join Supercharge Your Sermons . These lessons are nothing but "meat." And if you don't like reading, you can listen to the audios of each lesson. There is a real problem today with too much information. I know you are a busy pastor, you need quick data. Each lesson is designed to give you exactly what you need so that you can quickly put it into practice. Every weekly lesson will give you a number of assignments to complete at the close. Instead of telling you what I have done, you will receive exactly what you should do this coming week. Each week you'll have some easy-to-implement action step to complete before moving on. Every lesson builds on previous lessons. In the beginning we will discuss some of the basics to quickly create sermons. From there, we'll move into intermediate and then advanced tactics for multiplying and maximizing the effectiveness of your sermons. Beginners won't get lost from the start and veterans won't get bored as I'll throw in some golden nuggets along the way for our experienced crowd. While many books pile on a bunch of information and leave you to put it all together for yourself, that isn't how things are setup in this training program. By giving you information in bite-sized portions for a half year (26 weeks!) you'll be more likely to actually do something with the content ... and you'll be more likely to see real results for yourself. Almost immediately your people will see a change in your sermons. When you look back after each month, you will be able to see concrete things that you have implemented that have taken your sermons into overdrive. Each weekly lesson is designed to be immediately actionable. How to Implement The Black Preacher's Mindset! The Steps to a Supercharged Sermon! Special Supercharged Idea of the Week! 4 simple things to do to immediately place your sermons into overdrive! Lesson number one will explain a basic overview of the process. After that, we'll look at some advanced strategies for taking your Supercharged Sermons to the next level. This Does not Cost a Ton of Money! I am the web minister of SoulPreaching.Com. I would encourage you to visit there and look at my homiletic training methods. I have a Master of Divnity Degree from Vanderbilt Divinity School with an emphasis in Homiletics. I could be teaching homiletics right now with that kind of background, but have chosen to make my training available over the web. Now, a seminary course could cost thousands of dollars. A Bible School course could cost hundreds of dollars. But I wanted to keep this program as inexpensive as possible. It is for that reason that I am not going to charge the thousands of dollars that I could charge for this program. Instead, I'm going to make it a no-brainer, and I'm going to make it downright affordable for every budget. The price for a subscription to the Supercharge Your Sermons program is just $79 $49 per month. While the program is 6 months in length, you can cancel anytime you choose. What Will You Lose if You Don't Join the Course Now? Listen, here's the thing: I am going to offer you a 60 day money back guarantee. That means if you request a refund in the first 60 days you will get all of your money back! I stand behind my materials and know you'll be completely thrilled with the content and your results. However, for your peace of mind, know that a refund is available anytime for the next 8 weeks by simply emailing me . Yes, Sherman, I want my weekly text and audio lesson to learn how to plan, prepare, and preach my own sermons! I have read and agree to the legal disclaimer below. You will receive an email every week with a download link for your weekly .PDF/mp3 lesson. * Every effort has been made to accurately represent this product and its potential. Please remember that each individual’s success depends on his or her background, dedication, desire and motivation. As with any endeavor, there is no certain guarantee that you will succeed.